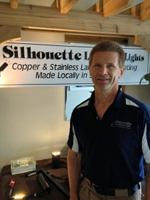 For your next high-end landscape and specialty lighting using low voltage light fixtures and transformers, contact Silhouette Landscape Lighting's Bill Converse, in Surrey, BC. We not only provide quality product directly to contractors on a wholesale basis, but we’ll help you find the best lighting solution. Whether it’s lighting for safety, mood or function, we have a lighting product in our catalog to suit your exterior landscape environment. Unit 105, 17957 – 55 Ave.
Silhouette Lighting's Bill Converse recognized that British Columbia’s west coast weather was a mild climate to live in, but harsh on landscape lighting due to salty marine air. He developed a line of low voltage landscape lighting that will stand up to harsh conditions and provide contractors with lighting that is both well-built and reasonably priced. Whether you want your lights to illuminate large walls, trees, pathways or to create a reflection in a pool of water, outside lights need to withstand the exterior elements. Built to our own exacting design specifications, Silhouette Lighting's brass, copper and stainless steel outdoor lights have stakes, sockets and brackets made of quality materials to avoid corrosion. 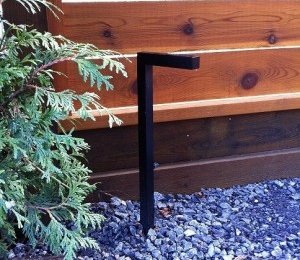 Bringing light to the outdoors, Silhouette Lighting fixtures are ready to install and only available to landscapers, contractors and builders.